A mercury vapor lamp consists of six major components: quartz sleeve or body, a gas/chemical mixture, electrodes, seal foil, end caps, and high voltage wires. The body of the lamp is made from a high quality transparent vitreous quartz tube. Unlike normal glass which blocks ultraviolet radiation, pure quartz has a high transmittance for light in the UV spectrum. Another important property of quartz is that it can withstand the high temperatures generated under normal operation while exhibiting a low coefficient of expansion. The factors most influencing the length of the body are arc length and curing surface area. Factors most influencing body diameter and wall thickness are operating power. The gas and chemical mixture sealed within the body consists primarily of argon and mercury. Through research, Albatross UV has found other compounds, when added to the argon/mercury amalgam, aid in extending lamp life and producing a more even illumination along the length of the lamp. Metal halides are also added to the contents of some lamps to increase the spectral intensity of specific wavelengths. 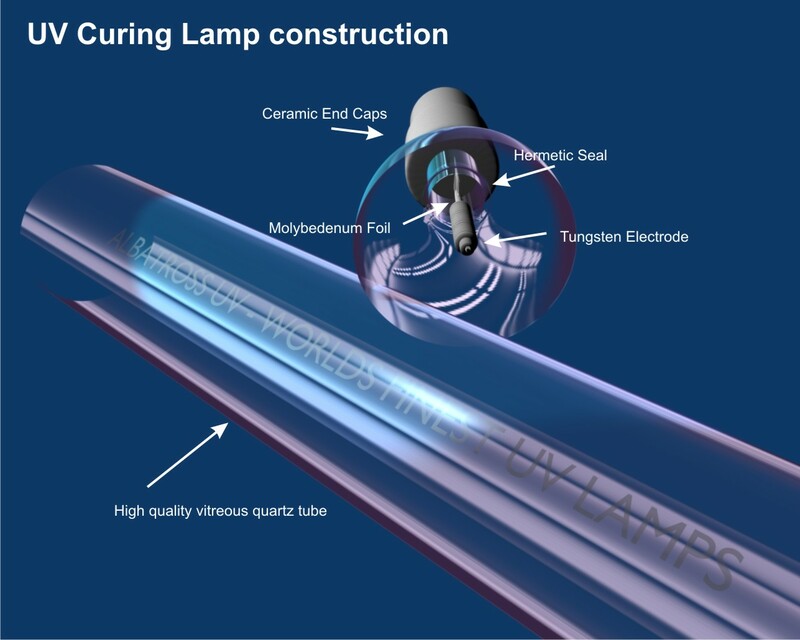 A tungsten electrode is located at the end of each lamp and is used to create the internal arc. The electrodes consist of a tungsten rod with tungsten wire wound around most of its length. Tungsten is used because it has good current handling characteristics, the lowest vapor pressure and coefficient of thermal expansion, and the highest melting point and tensile strength of all the non-alloyed metals. The lamp requires a good hermetic seal in order to operate. However, glass will not bind directly to the tungsten, so elliptically shaped etched molybdenum foil is used to create the electrical path between the electrodes and the external power source. Molybdenum has the sixth highest melting point of any element and an extremely low thermal expansion making it the perfect choice for a seal foil. End caps are installed on the end of each lamp to provide the means by which the lamp is physically mounted to the lamp fixture. There are two basic types of end caps: metal and ceramic. Metal end caps are used when the lamp mounting fixture also provides the electrical connection to the lamp. Ceramic end caps are used when power is supplied to the lamp via high voltage wires.